When you see your dog furiously itching you understandably get concerned. Often times a dog that is repeatedly scratching and biting its skin has eczema. Eczema is a skin condition that afflicts humans and their four-legged companions. The condition may be caused by several variables such as genetics and allergies. Low-quality dog food that lacks essential nutrients can also trigger the onset of eczema. In humans, this condition is easily spotted, but a dogs’ hair can make it hard to see. If your dog has eczema, or you think they may have the condition, you should go to a vet. However, you can also buy special dog food to reduce the inflammation and help your dog’s skin heal. The following three brands are vet-approved. In time they will help reduce your dog’s symptoms. 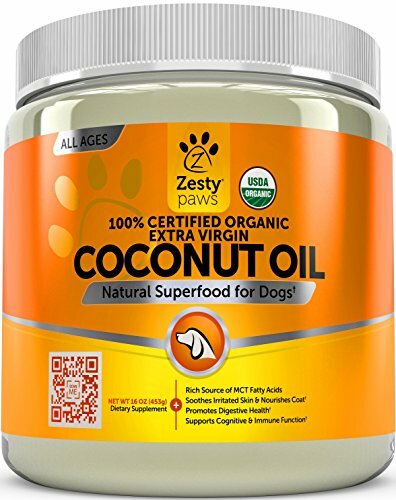 Zesty Paws is a coconut oil-based eczema solution. You can feed it to your dog to improve their eczema symptoms or apply it to their skin for greater symptom relief. This dog multipurpose dog food and lotion is made from organic ingredients. The great thing about Zesty Paws is the ability to provide immediate relief for your puppy. When applied to eczema hot spots the lotion reduces inflammation, itching, and gnawing. It helps heal dry skin and relieves your dog from uncomfortable flea bites. When fed to your dog, Zesty Paws will nourish your canine’s brain and digestive system. Boosting their immune system and reducing smelly puppy breath. Apply the coconut oil to your pet’s paws to help heal cracked foot pads. Merrick makes the highest quality dog food around. They make their food from locally sourced ingredients, and it is always free from grains and gluten. Cheap dog food companies load their food with filler grains that do nothing for your dog’s skin health. This brand makes their food with real salmon, beef, chicken, lamb, and sweet potatoes. When you are trying to find out what is causing your dog’s eczema flare-ups, Merrick is a great option. They list every ingredient on the bag, so you know what your dog is getting. 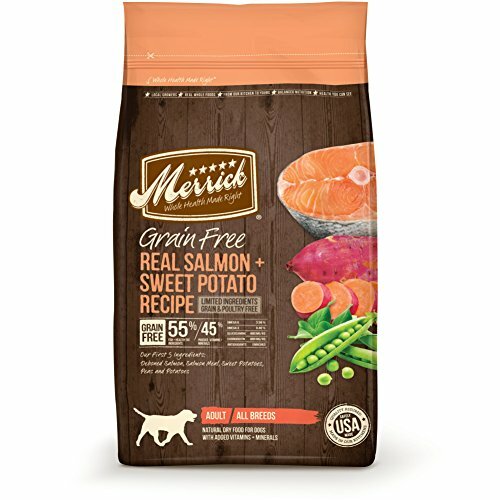 The best option for eczema is Merrick’s Salmon dog food. Salmon has omega-3 and omega-6 fatty acids, which not only support brain health, they also help with skin dryness caused by eczema. Most companies use scrap chicken or beef in their food. Your dog may be allergic to chicken, beef, grains, and gluten. 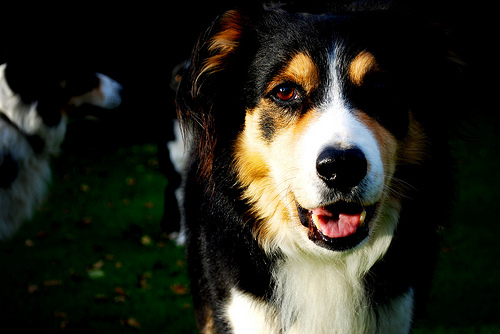 Try out Merrick’s lamb or salmon dog food, it may help rid your dog of skin issues for good! 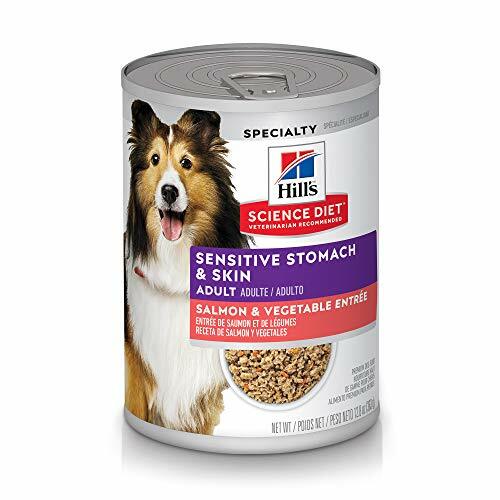 It’s always good to mix up your dog’s diet with some canned food. This is especially important for aging dogs. Hill’s Science is the perfect wet food for dogs with eczema and other skin issues. There are several options to choose from. However, the canned salmon food is made from high-quality salmon and vegetables. They have included natural sources of omega fatty acids and vitamin e. Soybean oil is used to give the food a better taste and provide more essential nutrients to your dog. Since soybean oil is considered a grain, Hill’s Science cannot claim to be grain free. Antioxidants have proven to be beneficial for skin problems like dryness and eczemas. To further protect your dog, they have added a unique blend of powerful antioxidants. This blend is clinically proven to help your dog fight infection. Eczema is also known as atopic dermatitis. The condition comes in two forms, dry and wet, with each variation inflicting distinct symptoms. With wet eczema, the affected region will seem scaly, pink or red, and possibly develop bumps. It is known as wet eczema due to its watery discharge. The dry type of eczema causes similar the affected place appears dry, colorless, flaky and the skin may begin to wrinkle. The main difference is dry eczema does not have a watery discharge. A canine affected by either will start to scratch and gnaw the infected spot. What Type of Ingredients Help with Dog Eczema? Foods made from salmon, and other fish, are very beneficial for dogs with eczema. Fish contains omega fatty acids that help heal your pets cracked skin. Another essential ingredient is vitamin E. Vitamin E is vital for dogs, it assures healthy skin and a shiny coat. Zesty Paws has a line of edible skin care products containing vitamin E and other ingredients to fight back against dry skin and inflammation. Probiotics will also help give your afflicted pup some more pep! Merrick makes their dry food with probiotics. Feeding your dog probiotics will boost your dog’s immune system so they can fight any infection they may have from their eczema. Eczema is an inflammatory problem that can lead to more severe infections. Antioxidants can boost your dog’s immune system and fight inflammation. You don’t need to buy a separate supplement either because Hill’s Science can food is made with antioxidants. Bottom line: with our above options, you’re sure to find the best dog food eczema so your loved one can suffer less and enjoy his canine life more. Good luck! For our pet food recommendations to other issues, please visit our other posts.